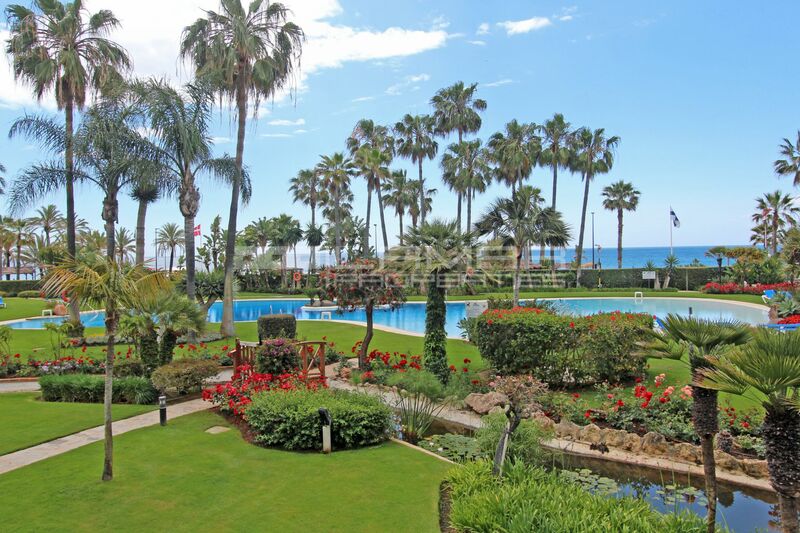 Frontline beach apartment with private pool with sea views in Puerto Banus, in the prestigious community Los Granados. 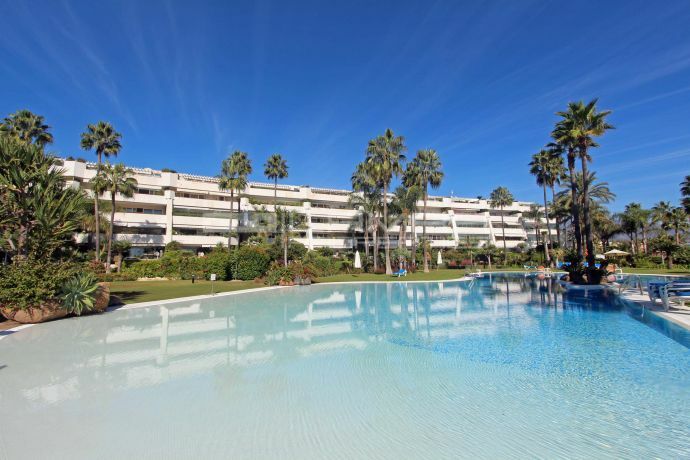 Los Granados is an exclusive and consolidated gated community with 24 hour security at a short walk of the marina of Puerto Banus where you will find all kind of shops, restaurants, coffee shop, banks, supermarket, cinema, ect. also El Corte Ingles. This beachfront complex enjoys a mature subtropical and manicured garden with streams, a large outdoor swimming pool, an indoor heated pool and Jacuzzi, steam bath and gymnasium. All the perimeter has surveillance cameras. This elevated garden apartment south oriented has a very large terrace and views over the communal gardens, swimming pool and the sea, and direct access to the communal garden and the beach. The entrance door opens onto a spacious hall connected with a large living room. The kitchen is completely equipped and has an adjoining laundry room. The master bedroom with ensuite bathroom has access to the terrace and has sea views. The other two bedrooms have each a bathroom en suite and share a large terrace closed with glass curtains. Includes parking for one car in the garage and storage room.